Near the dry, dusty edge of town lies an old rectangular shack resting on deflated wheels, a pre-Fall era concession truck that might have once sold hot dogs, tacos, or other treats. The old posters and menus that once decorated the truck are now plastered over with hand-painted signs that read “Professor Gigabyte’s Data Salvage - Fees Vary”. A steady chortling sound emanates from the disabled vehicle’s hood, but it is obvious the deteriorating “roach coach” isn’t going anywhere soon. The area around the pathetically-old truck is a dry, grassy yard littered with countless bits of discarded machinery, defunct electronics, and computer parts. Virtually all of these discarded parts are covered in rust and dirt, and are well beyond any possibility of repair. The small niche business known as Professor Gigabyte’s Data Salvage is run by a colorful former tech looter named “Gigabyte“. 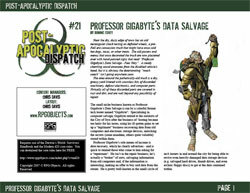 Specializing in computer salvage, Gigabyte retired to the outskirts of the City of Styx after the business of ‘looting became too hairy for his tastes, using his ill-gotten gains to set up a “legitimate” business recovering data from old computers and electronic storage devices, unlocking the secrets (some mundane, others quite valuable) stored within them.